I'm a big fan of Elizabeth Warren, the consumer advocate and Harvard professor who is heading up the new Consumer Financial Protection Bureau. I've written about her here as well. In her typical folksy style, Ms. Warren spent just under seven minutes on The Daily Show explaining what the agency is meant to do and how Congress is trying to block or delay the agency's work. In her short time, she used analogies, humor, conciseness, and the rule of three -- a technique that gives a satisfying rhythm to your speech -- to make her point while educating the audience. "What this agency really wants to do is, it wants to make prices clear, it wants to make risks clear, it wants to get rid of the fine print -- the word 'barf' in the middle of these contracts -- so that you can actually make direct comparisons. In other words, to try to make a financial market work for families. That's what this agency is all about." "Millions of Americans today live one bad diagnosis, one pink slip, one interest-rate-reset away from complete financial collapse." The fight isn't over. the fight moved from Main Street to the dark alleys. Now the game is, 'Let's just see if we can stick a knife in the ribs of this consumer agency.'" "Right now there are bills pending in Congress to delay the agency, to defund the agency, to defang the agency... make it toothless so it won't get anything done." She is also an expert at sticking to her key point, in this case, that the agency exists to serve middle class families. Ms. Warren is an inspiration to me, with her down-to-earth personality and her use of multiple effective public speaking techniques to get her message across with humor and style. She's become a master of the short interview, someone we can all learn from. How can you be more concise, more clear and still incorporate analogies, humor, the rule of three and other techniques into a short presentation? 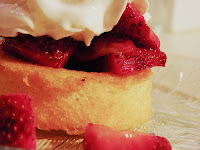 Strawberry shortcake photo by kendiala.